Harry Whitaker played basketball and baseball at Peoria Woodruff, but the major part of his outstanding career in District 150 started at Peoria Central. After graduating from Bradley, he eventually returned to Central to become head coach in basketball and baseball, and an assistant in football between 1954 and 1966, went on to become principal of the school and then superintendent of District 150. In basketball, Whitaker posted a 100-54 coaching mark, his Lions of 1962-63 finishing fourth in the state finals, after losing to eventual state champion Chicago Carver in overtime. His baseball teams went 111-42, the 1961 squad playing in the state finals in Peoria where it lost to eventual state champion Morton of Cicero. 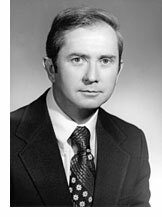 He also made a major contribution to the local prep sports scene in 1975 when he was superintendent of District 150. Facing a tax referendum that was needed to maintain extra curricular activities including sports, Whitaker made almost 200 speeches in its behalf and it passed by a narrow margin, insuring the 1976-77 athletic year for the local high schools. After the sports programs in District 150 were saved for the 1976-77 season, Central went on to win the 1977 state basketball tournament and Lion distance runner Dave Ayoub won the state 880 title. Whitaker is a member of the Bradley Athletic Hall of Fame.